Moscow said Seagal’s role would be to develop Russian-U.S. "humanitarian" relations, including in the fields of culture and art. 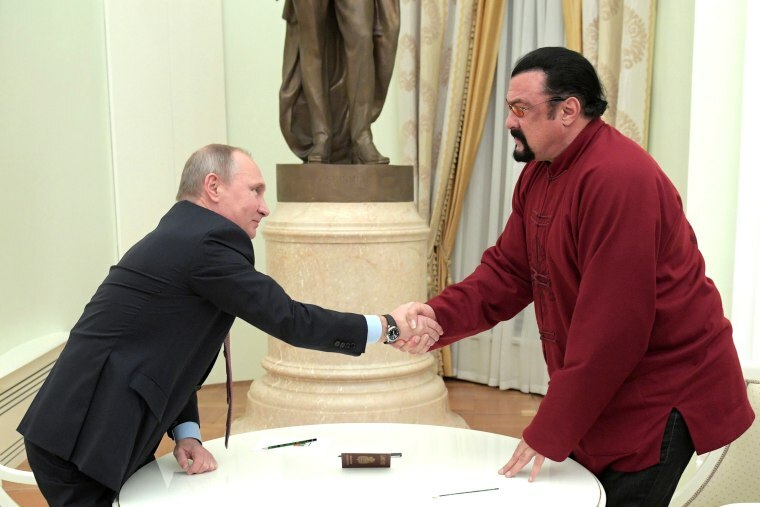 LONDON — Russia has appointed actor Steven Seagal as a special envoy to improve Russian-U.S. ties. The Russian Foreign Ministry announced the appointment on Saturday saying Seagal’s role would be to develop Russian-U.S. relations in the “humanitarian” sphere, including in the fields of culture, art and youth exchanges. The 66-year-old martial arts star — who rose to fame in the 1980's and 1990's for his roles in movies such as ‘Above the Law’ and ‘Under Siege’ — was granted Russian citizenship in 2016 and is a vocal supporter of President Vladimir Putin. Back in Hollywood, several women have accused Seagal of sexual misconduct — allegations he denies. On granting Seagal citizenship in 2016, Putin said he hoped it would serve as a symbol of how fractious ties between Moscow and Washington were starting to improve. But since then relations between the two countries have deteriorated, with U.S intelligence agencies accusing Moscow of meddling in the 2016 presidential election. The two nations are also at odds over Syria and Ukraine. The Russian foreign ministry likened Seagal’s new role to that of U.N. goodwill ambassadors, prominent individuals who volunteer to highlight important areas of the U.N.’s work. The role will be “socio-political” and Seagal will not receive a salary for his work, the foreign ministry said in the statement. “It’s a case when people’s diplomacy meets with traditional diplomacy,” the ministry added. Seagal, who sometimes appears on Russian state TV to talk about his views and career, was cited by Kremlin-backed TV station Russia Today (RT) as welcoming the appointment. “I’ve always had a very strong desire to do all I can to help improve Russian-American relations,” Seagal said according to RT. Elena Holodny and Reuters contributed.